Rat anti substance P antibody, clone NC1/34 (8450-0505) used for the detection of substance P expressing cells in human tendon tissue biopsies by immunofluorescence. Double stainings for PARs and substance P. A-D shows PARs - and E-H shows corresponding SP-staining; PAR-1 (A) is co-localised with SP-positive nerve fibres (E) (arrows). The same was seen for PAR-2 (nerve fascicle in B&F), PAR-3 (nerve fascicle in C&G) and PAR-4 (D&H, arrows show perivascular nerve fibres). 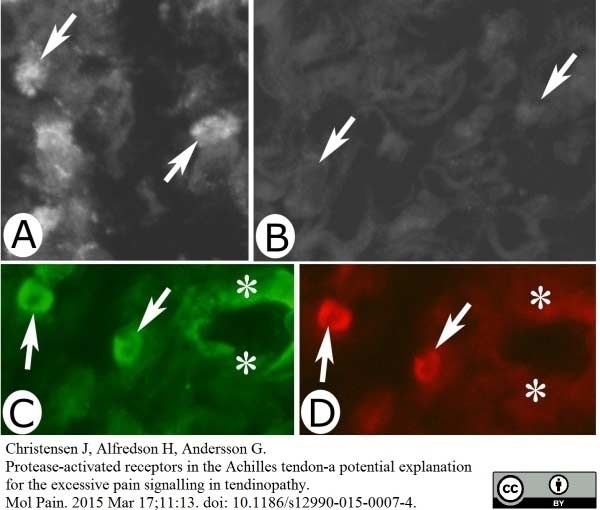 From: Christensen, J. Alfredson, H. and Andersson, G. "Protease-activated receptors in the Achilles tendon–a potential explanation for the excessive pain signalling in tendinopathy". Mol Pain. 2015 Mar 17;11:13. Rat antiSubstance P antibody, clone NC1/34 (8450-0505) used for the identification of substance P immunoreactive neurons in porcine dorsal root ganglia by immunofluorescence. Representative images of substance P-positive (SP+) dorsal root ganglia (DRG)-urinary bladder-projecting neurons (UBPN) in control pigs. All images were taken separately from blue (a,d,g,j,m,p), green (b,e,h,k,n,r) and red (c,f,i,l,o,s) fluorescent channels; a–c One fast blue-positive (FB+) neuron (a, blue, arrow), which simultaneously contains SP (b, green, arrow) and pituitary adenylate cyclase activating peptide-PACAP (c, red, arrow). d–f One FB+ neuron (d, blue, arrow), which is simultaneously SP+ (e, green, arrow) and calcitonin gene-related peptide-positive (CGRP+, f, red, arrow). g–i Two FB+ neurons (g, blue, 1 short arrow, 1 long arrow), which are simultaneously SP+ (h, green, 1 short arrow) or SP-negative (h, green, 1 long arrow) and galanin-positive (GAL+, i, red, 1 short arrow) or GAL-negative (GAL-, i, red, 1 red arrow). j–l One FB+ neuron (j, blue, arrow), which simultaneously contains neuronal nitric oxide synthase-nNOS (k, green, arrow) and SP (l, red, arrow). m–o One FB+ neuron (m, blue, arrow), which is simultaneously calbindin-positive (CB+, n, green, arrow) and SP+ (o, red, arrow). p-s One FB+ neuron (p, blue, arrow), which simultaneously contains SP (r, green, arrow) and somatostatin-SOM (s, red, arrow). Bars 50 μm (a–s). 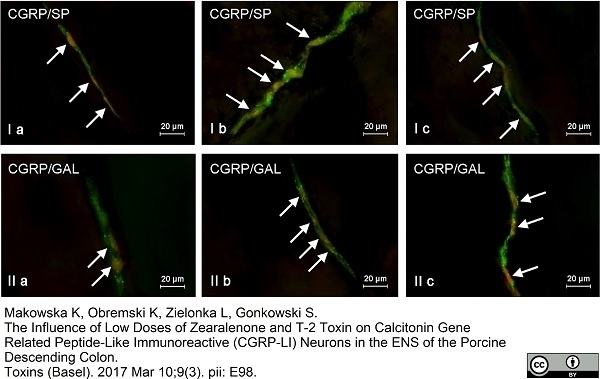 From: Bossowska A, Lepiarczyk E, Mazur U, Janikiewicz P, Markiewicz W. Botulinum Toxin Type A Induces Changes in the Chemical Coding of Substance P-ImmunoreactiveDorsal Root Ganglia Sensory Neurons Supplying the Porcine Urinary Bladder. Toxins (Basel). 2015 Nov 16;7(11):4797-4816. Representative images of substance P-positive (SP+) dorsal root ganglia (DRG)-urinary bladder-projecting neurons (UBPN) in BTX-treated animals. All images were taken separately from blue (a,d,g,j,m,p), green (b,e,h,k,n,r) and red (c,f,i,l,o,s) fluorescent channels; a–c one fast blue-positive (FB+) neuron (a, blue, arrow), which simultaneously contains SP (b, green, arrow) and pituitary adenylate cyclase activating peptide-PACAP (c, red, arrow). d–f One FB+ neuron (d, blue, arrow), which is simultaneously SP+ (e, green, arrow) and calcitonin gene-related peptide-positive (CGRP+, f, red, arrow). g–i One FB+ neuron (g, blue, arrow), which is simultaneously SP+ (h, green, arrow) and galanin-positive (GAL+, i, red, arrow). j–l One FB+ neuron (j, blue, arrow), which simultaneously contains neuronal nitric oxide synthase-nNOS (k, green, arrow) and SP (l, red, arrow). m–o One FB+ neuron (m, blue, arrow), which is simultaneously SP+ (n, green, arrow) and calbindin-negative (CB-, o, red, arrow). p-s One FB+ neuron (p, blue, arrow), which simultaneously contains SP (r, green, arrow) and somatostatin-SOM (s, red, arrow). Bars 50 μm (a–s). Rat anti substance P antibody, clone NC1/34 (8450-0505) used for the illustration of substance P expressing cells in porcine medulla oblongata by immubnofluorescence. From: Gańko M, & Całka J. Prolonged acetylsalicylic-acid-supplementation-induced gastritis affects the chemical coding of the stomach innervating vagal efferent neurons in the porcine dorsal motor vagal nucleus (DMX). Rat anti Substance P anitbody, clone NC1/34 (8450-0505) used for the evaluation of substance P expression on rabbit muscle nerve fasciles by immunofluorescence. Tachykinin-like immunoreactivity in nerve fascicles. Nerve fascicles and parts of nerve fascicles (N) of sections from gastrocnemius (A-C, E, F) and soleus (D) muscle specimens are shown. The sections were processed for demonstration of tachykinin-like immunoreaction (A-E). In (F) the reaction pattern after preabsorption with SP peptide is shown (the region in F corresponds to the region in E). The antibodies applied were sc-14104 (A-C, E) and 8450–0505 (D). The specimens were from the control group (A, B, E, F) and from the 6w group, non-exercised side, focal myositis area (C, D). There are immunoreactivities in nerve fascicles in the form of punctuate reactions (arrows A, C-E). These are grouped, as especially seen in (C), but also to some extent in (D). There are no reactions in the nerve fascicle in (B), which is built up of myelinated nerve fibers, and in the control section in (F). MF refers to muscle fibers. Magnification x200 (B, C), x315 (A, D, E, F). From: Song Y, Stål PS, Yu JG, Forsgren S.
Bilateral increase in expression and concentration of tachykinin in a unilateral rabbit muscle overuse model that leads to myositis. BMC Musculoskelet Disord. 2013 Apr 12;14:134. A,B. Tachykinin-like immunoreactivity in cells in inflammatory infiltrate of myositis area. Sections of a specimen from a soleus muscle specimen of the 6w group, non-exercised side. In (A), the section had been immunostained with 8450–0505, and in (B), the section was immunostained with 8450–0505 after preabsorption with tachykinin (SP) (larger area is covered in B than in A). Immunoreactivity is seen in cells in (A), but no reaction is visible in (B). Arrows point at cells of inflammatory infiltrate. The immunoreactions show partly a granular appearance (A). Magnification x315. c,d. Immunostaining with polyclonal and monoclonal tachykinin antibodies. A part of a focal myositis area of a section of a gastrocnemius muscle specimen from the 1w group, exercised side, double-stained for tachykinin using the sc-14104 (C) and 8450–0505 (D) antibodies, shown at low magnification. Note that the cells of an inflammatory infiltrate are immunolabelled in both (C) and (D) (arrows), whereas the wall of a small vessel is only immunostained in (C) (asterisks). Magnification x315. Rat anti Substance P antibody, clone NC1/34 (8450-0505) used for the demonstration of neurons in porcine descending colon by immunofluorescence. 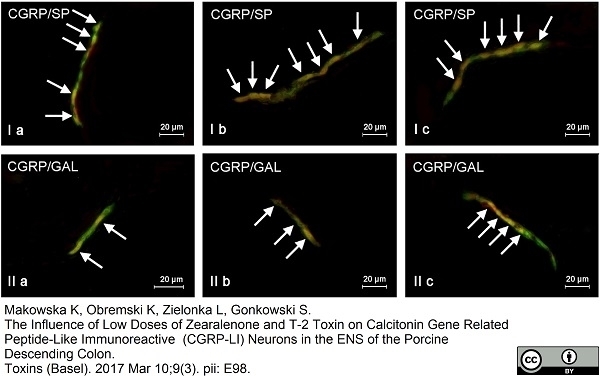 Representative images of co-localization of calcitonin gene-related peptide (CGRP) with other neuronal active substances in the neurons of myenteric plexus (I,II,III) and nerve fibers scattered in the circular muscle layer (IV) of the porcine descending colon under physiological conditions (a), and after T2-toxin (b) and zearalenone (c) administration. I—co-localization of CGRP with substance P (SP); II—co-localization of CGRP with galanin (GAL). 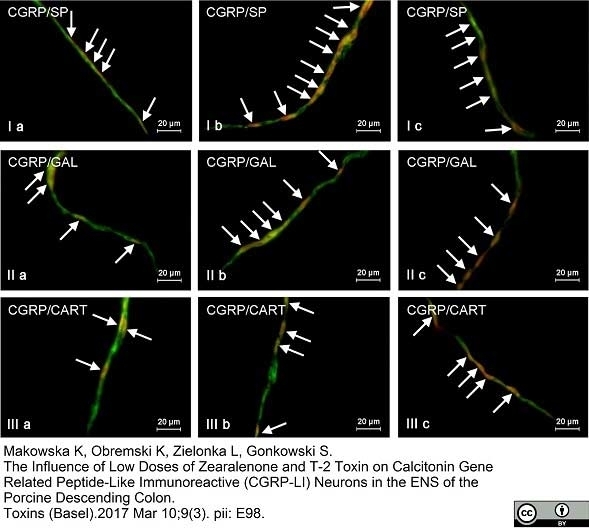 Images are composites of merged images taken separately from green (CGRP) and red (other substances studied) fluorescent channels. Nervous structures, where CGRP co-localizes with other substances, are indicated by arrows. Representative images of co-localization of calcitonin gene-related peptide (CGRP) with other neuronal active substances in the neurons of the outer submucous plexus in the wall of porcine descending colon under physiological conditions (a), and after T2-toxin (b) and zearalenone (c) administration. I—co-localization of CGRP with substance P (SP); II—co-localization of CGRP with galanin (GAL); III—co-localization of CGRP with cocaine- and amphetamine- regulated transcript (CART) peptide. Images are composites of merged images taken separately from green (CGRP) and red (other substances studied) fluorescent channels. Neurons, where CGRP co-localizes with other substances are indicated by arrows. Representative images of co-localization of calcitonin gene related peptide (CGRP) with other neuronal active substances in the neurons of inner submucous plexus (I,II,III) and nerve fibers scattered in submucous/mucous layer (IV) of the porcine descending colon under physiological conditions (a), and after T2-toxin (b) and zearalenone (c) administration. I—co-localization of CGRP with substance P (SP); II—co-localization of CGRP with galanin (GAL). Images are composites of merged images taken separately from green (CGRP) and red (other substances studied) fluorescent channels. Nervous structures, where CGRP co-localizes with other substances are indicated by arrows. Rat anti substance P antibody, clone NC1/34 recognizes the COOH terminal end of substance P, a short polypeptide neurotransmitter that regulates the excitability of dorsal horn nociceptive neurons. It is known to have a role in several physiologic activities such as pain transmission, the vomiting reflex, salivary secretion and smooth muscle contraction. 5% reactivity is observed with eledoisin. It does not react with Leu or Met-enkephalin, somatostatin or beta-endorphin. Spleen cells from immunised Wistar rat were fused with cells of the NS1/1-Ag 4-1 myeloma cell line. 1This product does not require antigen retrieval prior to staining of formalin fixed, paraffin embedded sections. Kozsurek, M. et al. (2009) Nonselective innervation of lamina I projection neurons by cocaine- and amphetamine-regulated transcript peptide (CART)-immunoreactive fibres in the rat spinal dorsal horn. Eur J Neurosci. 29: 2375-87. Cuello AC et al. (1980) Use of monoclonal antibodies in immunocytochemistry with special reference to the central nervous system. Brain Res Bull. 5 (5): 575-87. Pioro, E.P. et al. (1985) Loss of substance P immunoreactivity in the nucleus of the spinal trigeminal tract after intradural tumour compression of the trigeminal nerve. Mai, J.K. et al. (1986) Substance P in the human brain. Cuello, A.C. et al. (1979) Detection of substance P in the central nervous system by a monoclonal antibody. Proc Natl Acad Sci U S A. 76 (7): 3532-6. Kato, A. et al. (2012) Endocannabinoid-dependent plasticity at spinal nociceptor synapses. J Physiol. 590 (Pt 19): 4717-33. Bulc, M. et al. (2013) Immunohistochemical characterization of the porcine nodose ganglion. Acta Histochem. 115 (5): 440-6. Boorsma, D.M. et al. (1982) Direct immunocytochemistry with a horseradish peroxidase-conjugated monoclonal antibody against substance P.
J Histochem Cytochem. 30: 1211-6. Mortimer, S.T. et al. (1990) Immunohistochemical identification of calcitonin gene-related peptide and substance P in nerves of the bovine parathyroid gland. Cell Tissue Res. 261: 339-45. Galligan, J.J. et al. (1988) Changes in surviving nerve fibers associated with submucosal arteries following extrinsic denervation of the small intestine. Cell Tissue Res. 253: 647-56. Horn, J.P. and Stofer, W.D. (1989) Preganglionic and sensory origins of calcitonin gene-related peptide-like and substance P-like immunoreactivities in bullfrog sympathetic ganglia. Verhaert, P. & De Loof, A. (1985) Substance P-like immunoreactivity in the central nervous system of the blattarian insect Periplaneta americana L. revealed by a monoclonal antibody. Polgár, E. et al. (2007) A population of large neurons in laminae III and IV of the rat spinal cord that have long dorsal dendrites and lack the neurokinin 1 receptor. Eur J Neurosci. 26: 1587-98. Nowicki, M. et al. (2007) Peptidergic and nitrergic innervation of the pineal gland in the domestic pig: an immunohistochemical study. Anat Histol Embryol. 36: 311-20. Nair-Roberts, R.G. et al. (2006) Distribution of substance P reveals a novel subdivision in the hippocampus of parasitic South American cowbirds. J Comp Neurol. 496: 610-26. Song, Y. et al. (2013) Bilateral increase in expression and concentration of tachykinin in a unilateral rabbit muscle overuse model that leads to myositis. BMC Musculoskelet Disord. 14: 134. Szczurkowski, A. et al. (2013) Morphology and immunohistochemical characteristics of the pterygopalatine ganglion in the chinchilla (Chinchilla laniger, Molina). Pol J Vet Sci. 16 (2): 359-68. Pidsudko, Z. 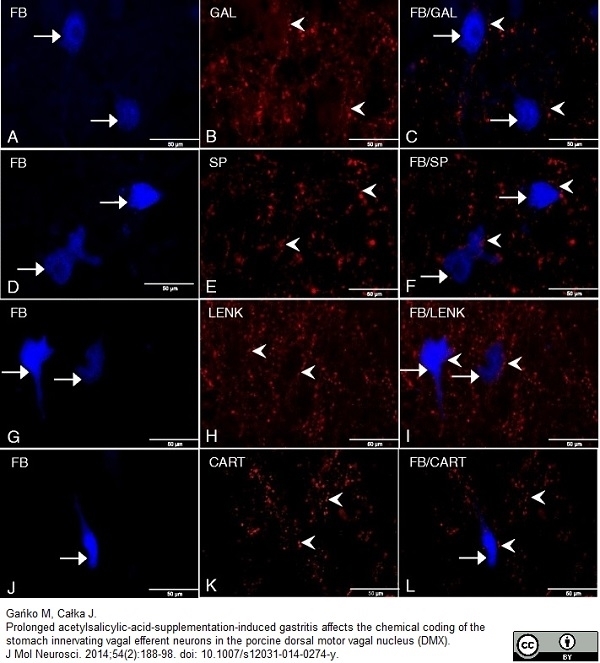 (2014) Immunohistochemical characteristics and distribution of sensory dorsal root Ganglia neurons supplying the urinary bladder in the male pig. J Mol Neurosci. 52 (1): 71-81. Zacharko-Siembida, A. et al. (2014) Co-expression patterns of cocaine- and amphetamine-regulated transcript (CART) with neuropeptides in dorsal root ganglia of the pig. Acta Histochem. 116 (2): 390-8. Ibrahim, D. et al. (2015) Immunohistochemical studies for the neuronal elements in the vomeronasal organ of the one-humped camel. J Vet Med Sci. 77 (2): 241-5. Christensen, J. et al. (2015) Protease-activated receptors in the Achilles tendon-a potential explanation for the excessive pain signalling in tendinopathy. Bossowska, A. et al. 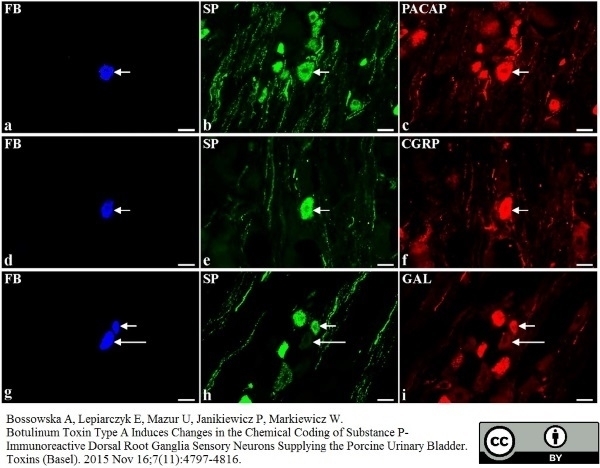 (2015) Botulinum Toxin Type A Induces Changes in the Chemical Coding of Substance P-Immunoreactive Dorsal Root Ganglia Sensory Neurons Supplying the Porcine Urinary Bladder. Toxins (Basel). 7 (11): 4797-816. Sienkiewicz, W. et al. (2015) Innervation of the chinchilla testis, epididymis, and vas deferens. Bulletin of the Veterinary Institute in Pulawy. 59 (4): 547-56. Czujkowska, A. & Arciszewski, M.B. (2016) Galanin is Co-Expressed with Substance P, Calbindin and Corticotropin-Releasing Factor (CRF) in The Enteric Nervous System of the Wild Boar (Sus scrofa) Small Intestine. Anat Histol Embryol. 45 (2): 115-23. Klimczuk, M. et al. (2016) Immunohistochemical characterisation of neurons in the mandibular ganglion and nerve fibres supplying the porcine mandibular gland. Gańko, M. & Całka, J. (2014) Localization and chemical coding of the dorsal motor vagal nucleus (DMX) neurons projecting to the porcine stomach prepyloric area in the physiological state and after stomach partial resection. J Mol Neurosci. 52 (1): 90-100. Gańko M & Całka J (2014) Prolonged acetylsalicylic-acid-supplementation-induced gastritis affects the chemical coding of the stomach innervating vagal efferent neurons in the porcine dorsal motor vagal nucleus (DMX). J Mol Neurosci. 54 (2): 188-98. Dudek, A. et al. 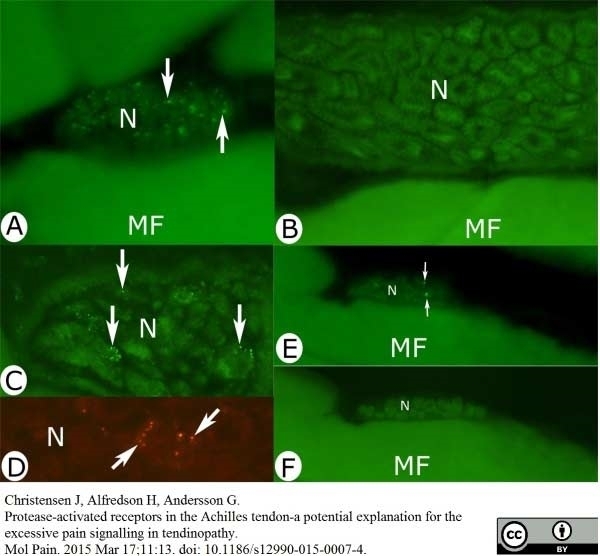 (2016) Chemical Coding of Sensory Neurons Supplying the Hip Joint Capsule in the Sheep. Acta Veterinaria. 67 (3) [Epub ahead of print]. Rytel, L. et al. (2018) Neurochemical characterization of intramural nerve fibres in the porcine oesophagus. Anat Histol Embryol. Aug 14 [Epub ahead of print]. Zalecki, M. (2019) Gastric ulcer induced changes in substance P and Nk1, Nk2, Nk3 receptors expression in different stomach localizations with regard to intrinsic neuronal system. Histochem Cell Biol. 151 (1): 29-42.